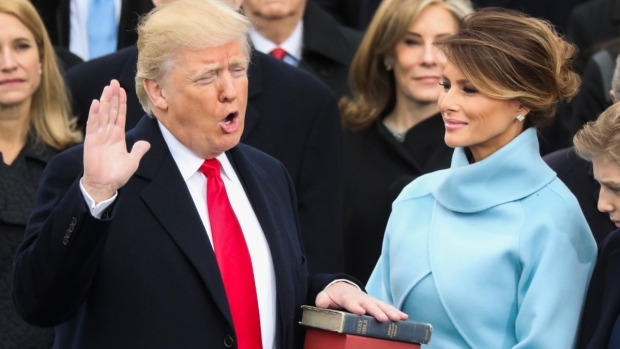 Donald Trump, the real estate mogul and reality television star who upended American politics and energized voters angry with Washington, took the oath of office Friday to become the 45th president of the United States and lead a riven nation. Trump, who campaigned on the promise of making America great again, was sworn in by Chief Justice John Roberts just after noon with his hand on two Bibles: his own and one used by Abraham Lincoln in 1861. 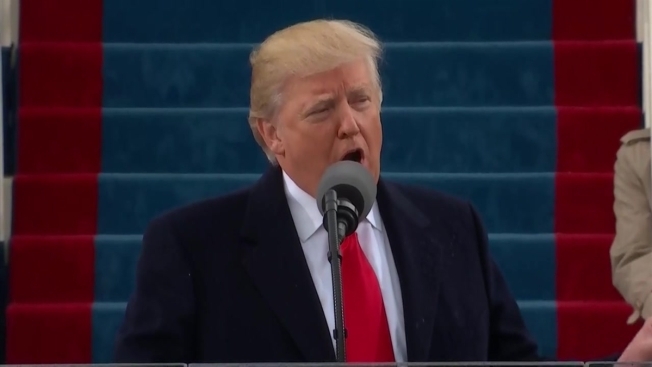 Pledging to empower America's "forgotten men and women," Trump said the inauguration day marks the transfer of power from Washington, D.C., "back to you, the people." His inauguration capped an unlikely rise for a man who has never before served in government. At 70, Trump is the oldest person to be sworn in as president. He campaigned on a populist, outsider platform, promising to 'drain the swamp' in Washington, and railing against his opponent Hillary Clinton's Wall Street ties, yet he has assembled an administration full of political insiders and Goldman Sachs executives. Republicans now control the White House, House of Representatives and Senate, with an open seat in the Supreme Court, giving the party a chance to reshape the nation after eight years under Barack Obama. And while Trump signed an exective order hours after his swearing-in, he spent most of the first hours of his presidency taking care of ceremonial duties. At a luncheon, he offered a standing ovation to his election opponent, Hillary Clinton, and her husband, former President Bill Clinton. Trump walked and presided over the inaugural parade, then sat at the desk in the Oval Office. And he danced to Frank Sinatra's "My Way" with first lady Melania Trump at the first of three inaugural balls he planned to attend, before being joined on stage by his vice president and their families. "We didn't have a chance, but we knew we were gonna win and we won. And today we had a great day," Trump said at the ball, going on to promise that real work is about to begin. The new president tried to use his address to deliver a message of unity and make a statement about his vision for the country, what it means to be an American and the challenges facing the middle class. In his 16-minute address, Trump painted a bleak picture of the nation he now leads, lamenting crime, shuttered factories and depleted American leadership. He vowed to stir "new national pride," bring jobs back to the United States, and "eradicate completely" Islamic terrorism. "America will start winning again, winning like never before," Trump said. "We will bring back our jobs, we will bring back our borders, we will bring back our wealth and we will bring back our dreams." Trump said when "America is united, America is totally unstoppable" and added that “when you open your heart to patriotism there is no room for prejudice." Some protesters tried to do their best to derail the celebrations. In the morning, dozens lined up across a security checkpoint near the Capitol, in one case, chaining themselves to a barricade. Shortly before President Trump took office, police gave chase to a group of about 100 protesters who smashed the windows of downtown businesses as they denounced capitalism and Trump, NBC Washington reported. Police in riot gear used pepper spray from large canisters and eventually cordoned off the protesters. Later in the day, while Trump was having a luncheon with lawmakers, police again clashed with demonstrators — this time with a larger group. 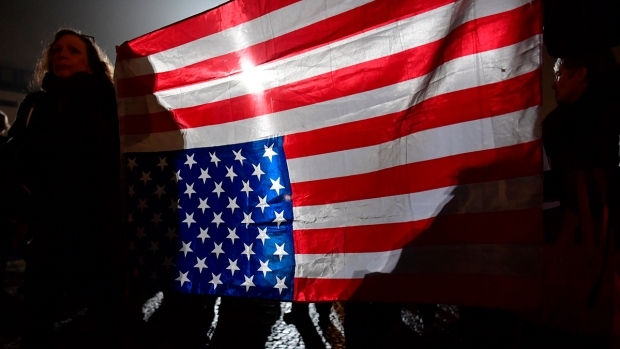 Well over 1,000 protesters were in the streets for a confrontation with police. Authorities again were using pepper spray, and some demonstrators appeared to have difficulty breathing. Some in the crowd were throwing cups, water bottles and objects — including chunks of concrete. Some protesters rolled large steel trash cans at police. By 6:30 p.m., 217 people had been arrested across the city, and six officers had minor injuries, police said. The new president began his day by attending services at St. John’s Episcopal Church near the White House along with Vice President-elect Mike Pence and their families, a precedent set by Franklin D. Roosevelt and followed by every president since. The Trumps then had tea with President Barack Obama and first lady Michelle Obama at the White House. Upon their arrival, Melania Trump presented Michelle Obama with a Tiffany & Co. blue gift box tied in white satin ribbon. Moments earlier, Vice President Biden welcomed the incoming vice president, Mike Pence. Before welcoming his successor, Obama took a final stroll from the Oval Office through the Rose Garden as a sitting president. Trump and Obama emerged from the White House together and stepped inside the presidential limousine for the short trip to the Capitol, where they joined ex-presidents and dignitaries, Hillary Clinton among them. "I'm here today to honor our democracy & its enduring values. I will never stop believing in our country & its future. #Inauguration," the 2016 Democratic presidential nominee tweeted. 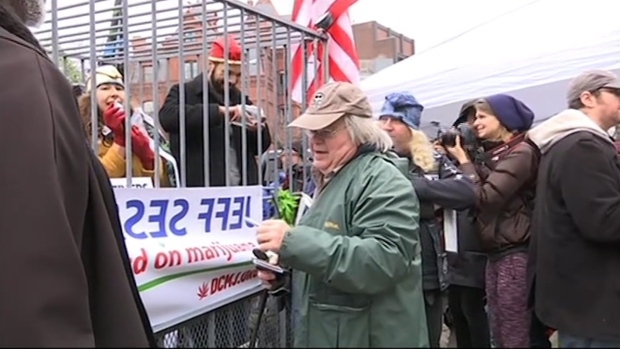 A marijuana legalization advocacy group handed out over 8,400 joints in Washington, D.C., as a protest during the inauguration of President Donald Trump. All of the living American presidents were in attendance at the swearing in ceremony, except for 92-year-old George H.W. Bush, who was hospitalized this week with pneumonia. His wife, Barbara, was also admitted to the hospital after falling ill. The ceremony began at 11:30 a.m. ET with Trump entering the inaugural podium giving his trademark thumbs up. After taking the oath, Trump didn't waste much time before signing some presidential paperwork. The new president signed formal nominations for each of his Cabinet picks and other members of the new administration. At a luncheon after his inauguration, Trump said he was honored by Bill and Hillary Clinton attending. He asked them to stand, and they received a standing ovation. "I have a lot of respect for those two people," Trump said. He also said that, whether Republicans or Democrats, "we're all good people." Trump and Pence participated in the traditional inaugural parade starting around 3:30 p.m. ET. Trump drove through the first part of the parade but emerged after about a half-hour to walk part of the route with family members. He went back into his vehicle but then emerged again about 20 minutes later, walking and waving to the crowd. Starting early in the morning of Donald Trump's inauguration ceremonies on Jan. 20, protesters clashed with police. At least 90 people were arrested. 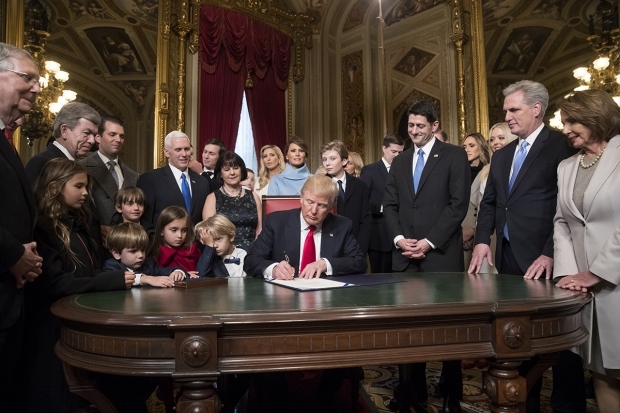 Eager to demonstrate his readiness to take actions, Trump went directly to the Oval Office Friday night, before the inaugural balls, and signed his first executive order as president — on "Obamacare." Chief of Staff Reince Priebus said it was an order to federal departments "minimizing the economic burden" of President Barack Obama's Affordable Care Act. He would provide no details. Trump also signed commissions for two former generals confirmed to Cabinet posts earlier by the Senate: James Mattis as secretary of defense and John Kelly to head the Department of Homeland Security. Vice President Mike Pence swore them in soon after. The day was not all pageantry and celebration, coming after an ugly presidential campaign and a contentious aftermath. More than 60 House Democrats boycotted Trump's inauguration ceremony, an unprecedented break with the bipartisan tradition of celebrating the peaceful transfer of power. Among their reasons are Trump's treatment of women, minorities and the disabled during the campaign and alleged links between his team and Russia. House Democrats attending Trump's inauguration wore special buttons as a silent protest of Republican efforts to repeal President Barack Obama's health care law. The blue buttons say #protectourcare, a Twitter hashtag that some advocacy groups have been using to rally support for the law. Trump has pledged to upend Obama's major domestic and national security policies, including repealing his signature health care law and building a wall along the U.S.-Mexico border. But he's offered few details of how he plans to accomplish his agenda, often sending contradictory signals. 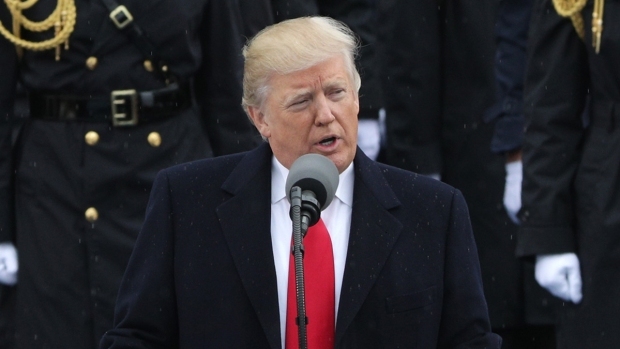 On Jan. 20, as revelers celebrated and protesters and disrupters clashed with police across the city, Donald Trump was sworn in as the 45th president of the United States. Ebullient Trump supporters flocked to the nation's capital for the inaugural festivities, some wearing red hats emblazoned with his "Make America Great Again" campaign slogan. "I'm here for history," said Kevin Puchalski, a 24-year-old construction worker who drove from Philadelphia to attend the swearing-in. "This is the first president that I voted for that won." His big hope: Trump builds that promised wall on the U.S.-Mexican border. "Keep the illegals out," he said. The Secret Service told NBC News early Friday that federal agents at security check points near the Capitol were screening 1,500 people an hour. Officials estimated that 800,000 to 900,000 people will be present for Inauguration Day festivities, though the crowds appeared smaller than past celebrations. While Trump revelled in a celebratory lunch with lawmakers and a parade down Pennsylvania Avenue — passing his newly opened Washington hotel — workers at the White House were setting about the frantic process of moving out the Obamas and preparing the residence for its new occupants. Moving trucks were on standby Friday morning at the White House. Obama, who will continue to live in Washington, left town with his family after the inauguration for a vacation in Palm Springs, California. He addressed a farewell gathering of staff at Joint Base Andrews before boarding his last flight on the military aircraft that ferries presidents on their travels.